In Ayurvedic medicine, "Tamrajal" (copper-charged water) is said to balance your doshas for good health. In Ayurvedic medicine, one of the world's oldest healing systems, "Tamrajal" (copper-charged water) is said to balance your doshas—the foundation of good health and well-being. 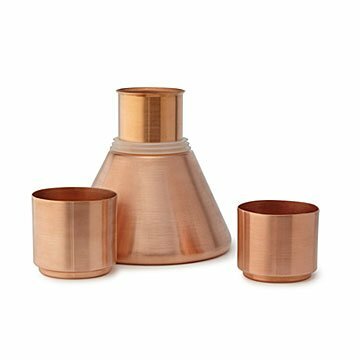 Rashimi Ranade worked with Indian copper artisans on this carafe, which is designed with not only a sleek place to store water, but also two tumblers. Set it bedside for elegant sips when the sun rises, or at the kitchen table to keep your doshas happy and hydrated. Handmade in India. Rashmi Ranade is a trained architect and product designer from the JJ school of Architecture at the Indian Institute of Technology in Mumbai. She has spearheaded product design, planning, brand positioning, and graphic design for clients in her design studio for more than two decades. Later in her design practice, she began to look for a design identity that was more related to the culture she was part of. So, she worked with a number of artisan collectives in India, advocating to incorporate heritage into their crafts. The uncoated water bearers should be washed daily with a soft cloth and a metal cleaning agent. Wipe dry immediately after washing. It is important to wipe dry to avoid water stains. Washing and wiping on a daily basis will help retain the coppery shine on your product and will also prevent the build-up from the natural oxidation process of copper when it is exposed to the atmosphere.Do not use your water carrier to store any liquid apart from water as it is unsafe to expose copper to food acids.Never use abrasive cleaning pads to clean your copper ware.